So, how does one car receive such an outpouring of praise, especially when parked in the garage of one of the best automotive museums in the world, full of some of the most incredible cars in the world? That’s easy; it’s stunning to look at, and subtly beautiful inside and out. The first thing that catches your eye is the paint color: Nardo Grey. It’s an understated and sophisticated grey that you rarely see on the road. When you get closer, you begin to realize that it’s not metallic, nor is it matte; this color has captivated your attention like no other color can. Nardo Grey has been steadily rising in popularity with luxury car brands, and this 750i does not disappoint. You approach a little closer and spy a flash of caramel; you have to take a peek at the interior now! A rich tan leather interior with black leather piping greets your eyes. The Cognac Nappa seats are sewn in a quilted pattern on the backrest in the front and rear seats, hiding seat warmers, ventilation, even massaging rollers! No wonder everywhere we drive it we consistently get compliments, just from looks alone this vehicle turns heads. 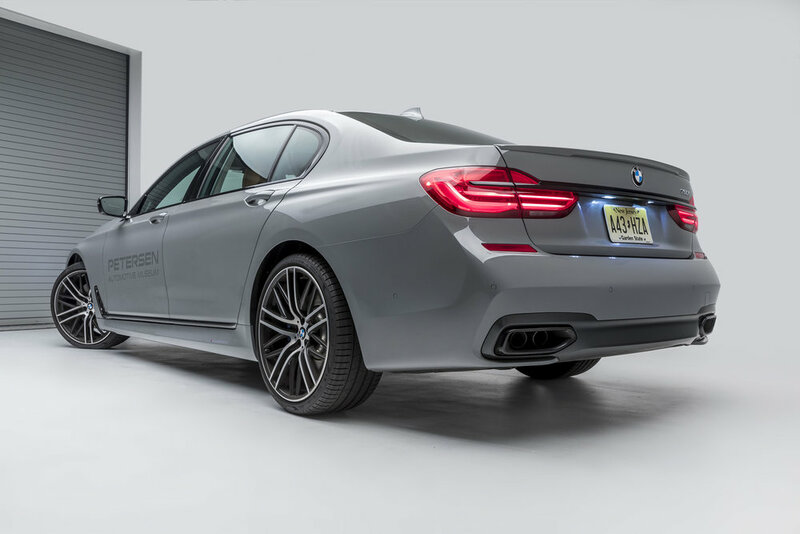 The 2018 BMW 750i has a 4.4-liter twin-turbo V-8 that pumps out 445 hp. In case you find yourself on a long stretch of empty road, it can accelerate from 0-60mph in 4.3 seconds. That’s faster than it probably took you to read those specs! Its top speed is 130 mph which could get you from the Petersen to Monterey Car Week in less than 2.5 hours (assuming, of course, you were driving at top speed all the way up). 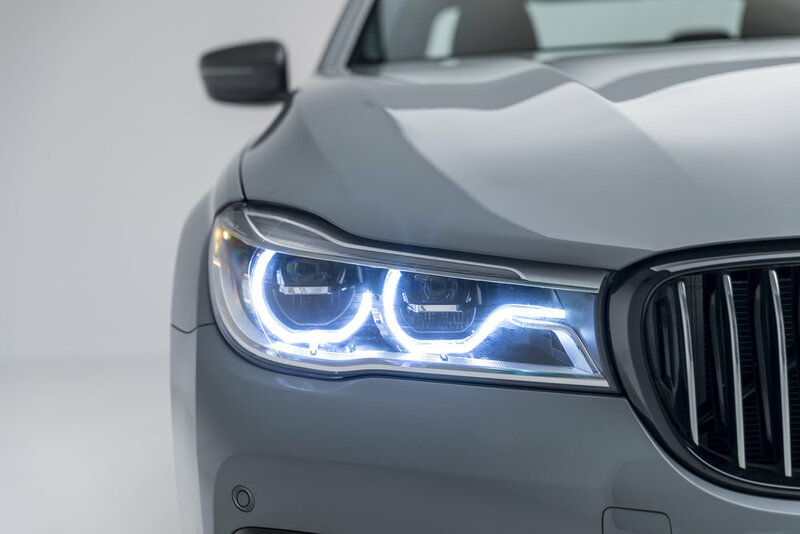 If that’s not enough, the technology in the 2018 BMW 750i is nothing short of magic. Touch screens make programming the ambient temperature as easy as scrolling through your phone, and BMW has even added air gestures so you can select apps, music, and destinations all without having to look at your screen! 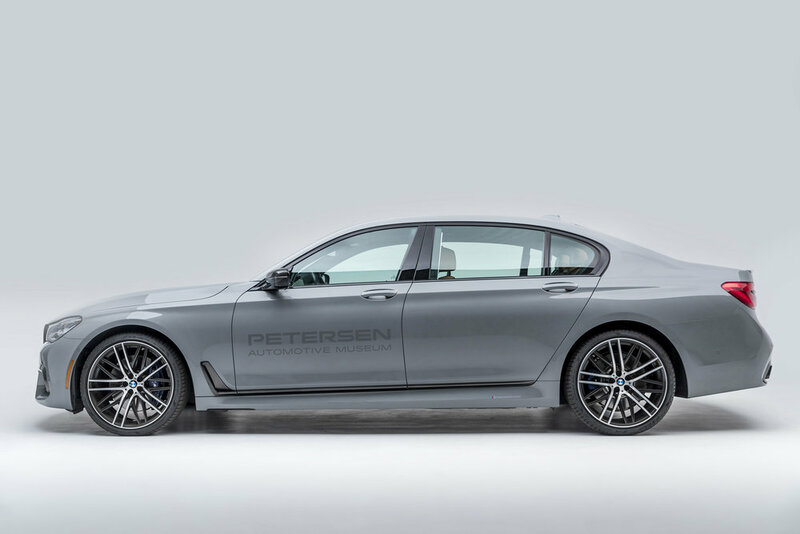 So next time you’re visiting us at the Petersen Automotive Museum, make sure you take a look around the parking garage, you just might become mesmerized by our 2018 BMW 750i fleet car!